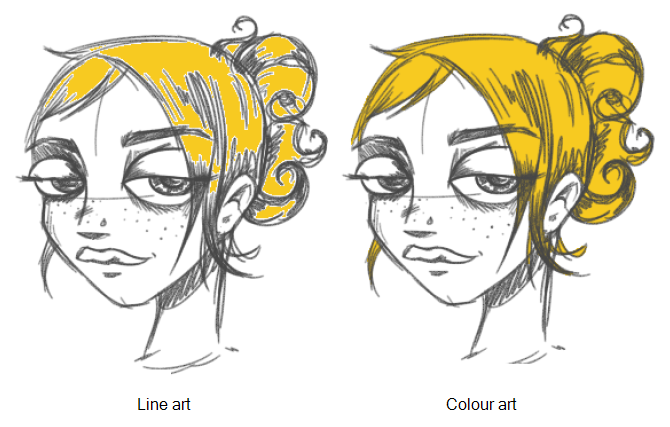 You can choose to paint your animation in the Line Art or Colour Art level. You can paint in Line Art, but for traditional and paperless animation, you should fill your colour zones in Colour Art. You can access the art layers through the Art Layer toolbar—see Art Layers. There are many advantages to separating the lines and colour zones, but the main one concerns the painting process. To paint very quickly, it's useful to not have to worry about painting over the lines. If the lines are separated, you can fill the zones very quickly and you will never accidentally paint the lines. Conversely, if you are inking the lines, you will not repaint the colour zones either. If you have transparent lines, bitmap lines, or textured lines with transparency, it's better to have your colour zones bleeding under your lines to avoid seeing the backgrounds and other elements through the lines. NOTE: To avoid painting in Line Art by mistake, turn off the Preview mode and paint in the Drawing view instead of the Camera view. Press P to turn the mode on or off.